From marking items in your kitchen to making sure that you can make signs of your daily specials, it’s important to have markers on hand at your café or restaurant. Markers 4 U, Inc., offers a variety of permanent and water-based paint markers for your needs, including Expo Bright Sticks and Zig markers. With these selections, you’ll be able to confidently mark dates on items without having to worry about the ink rubbing off, as well as make a colorful daily sign display encouraging customers to eat at your establishment. Whether you need markers for your kitchen or wait staff, the selections from our business are exactly what you need. We know what you are looking for and are ready to help you find quality permanent and water-based paint markers that will work well and fit your budget. 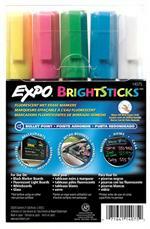 Take a look at the Expo Bright Sticks, Zig markers, and other selections we offer and place an order with our business today. Multicolor set of 8 Zig Illumigraph Wet Wipe Medium Chisel Point Markers. White, Fluorescent Violet, Fluorescent Red, Fluorescent Light Blue, Fluorescent Green, Fluorescent Pink, Fluorescent Orange and Fluorescent Yellow. Highly Fluorescent, Wet Wipe markers suitable for a variety of surfaces, especially glass, mirrors, whiteboards and chalkboards. Multicolor set of 8 Zig Illumigraph Wet Wipe Big and Broad Markers. White, Fluorescent Violet, Fluorescent Red, Fluorescent Light Blue, Fluorescent Green, Fluorescent Pink, Fluorescent Orange and Fluorescent Yellow.